William Girdler’s final film, The Manitou (1978), is just about the craziest knock-off of The Exorcist (1973) yet fashioned, and as a result, the director’s most entertaining cinematic effort. Every frame seems infused with the director’s gonzo desire to push the limits and dazzle the audience, and accordingly The Manitou zig-zags merrily between inventive special effects sequences and over-the-top moments of bloody horror. What the movie sacrifices in coherence, it thus gains in terms of jaw-dropping spectacle. Underneath it all, the film's story and its consequences are utterly ridiculous, but that fact doesn’t stop Girdler from going for broke with his dedicated, throw-everything-out-and-see-what-sticks approach to the material. 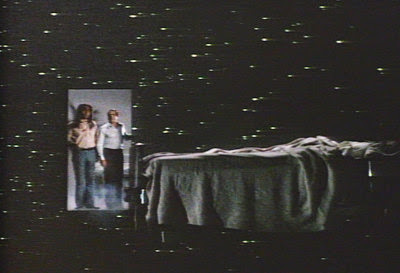 Because of the director’s non-conventional, open and inventive approach to the material, Girdler stages some moments -- such as a creepy séance and a levitating old lady -- with real ingenuity. The Manitou is in no way a great movie, which seems to be my refrain this week on the blog (see: The Legend of Boggy Creek), and yet it ably demonstrates how Girdler was growing with each opportunity behind the camera, and gaining a sense of confidence in his work. He also notes that the last thirty minutes of the film are a high point, a “mind-blowing barrage of special effects, each one more outrageous than the last.” On all these points, he is absolutely correct. I thus maintain that Girdler’s early death (in a helicopter accident…) was not only a terrible personal tragedy, but a loss for the genre. I just can’t help but believe that had the Kentucky filmmaker lived, he would have made some very memorable genre movies in the 1980s; films that we'd all be talking about and reviewing on blogs to this day. As it stands, The Manitou -- so visually-daring and yet also bizarre story-wise -- is Girdler’s last hurrah. The film is weird and wild -- incredibly variable in quality -- and a lot of fun. And that description perhaps, is the best epitaph for Girdler’s career in movie horror. A woman named Karen Tandy (Susan Strasberg) is admitted to a San Francisco hospital because of a strange, expanding growth on her back. At first, the growth is believed to be a tumor, but Dr. Hughes (Jon Cedar) and Dr. McEvoy (Paul Mantee) determine that it is not actually a growth, but a fetus. Harry Erskine (Tony Curtis) a fortune teller and friend of Karen’s is disturbed that the constantly-growing fetus-thing can’t be removed by any conventional means. Dr. Hughes attempts surgery, but cuts his own hand during the operation. Later, a hospital laser grows crazy and starts blasting the operating theater during a second removal attempt. After consulting with a medium and a historian Dr. Snow (Burgess Meredith), Erskine recruits Native American medicine man John Singing Rock (Michael Ansara) to fight the thing growing inside of Karen. As it turns out, this weird “baby” is the reincarnated form of an ancient, evil medicine man called Misquamacus. Misquamacus is angry because x-rays have mutated him, and he emerges from Karen’s back deformed, hideous, and seeking power. Planning to take over the world, Misquamacus summons several manitou -- evil spirits, including the Lizard God, The North Wind, and Satan himself. But, as Harry realizes, every object in the world possesses a manitou, and he hopes to harvest the hospital’s equipment to strike back against Misquamacus before he grows invincible. 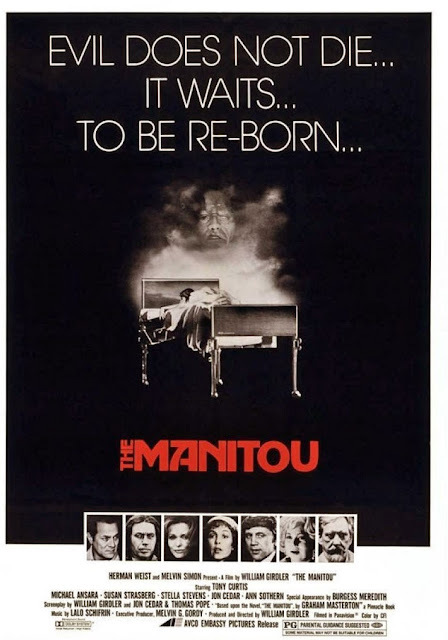 The Manitou features several notable trademarks of the 1970s cinema, including the possession/exorcism scene (familiar not just from The Exorcist, but also Girdler’s Abby), the “birth” or hospital delivery scene gone wrong (It’s Alive), and finally, the zippy laser beams of George Lucas’s Star Wars. That’s just the final touch, however, in Girdler’s crazy kaleidoscope. My favorite scene in the film is the one in which a little, blue-haired old lady arrives to have her fortune read at Harry’s apartment, and is suddenly possessed by Misquamacus. Without warning, this senior citizen busts a move, commencing a Native American rain dance (which alone is a sight to behold...), and then levitates through Harry’s apartment, out into the upstairs hallway. Finally, the spirit hurls her down the stairs, taking much of the staircase banister with her body, absolutely pulping the construction. The scene escalates from off-kilter to bizarre to I-can’t-quite-believe-what-I’m-seeing insane in just a few minutes. And the levitation effects still hold up. Another moment that is splendidly orchestrated finds Harry attempting a séance with his friends, including a medium. During the séance, Misquamacus appears, but not in any conventional sense. Rather than using wispy opticals or visual effects to represent the spirit, Girdler tries something truly original instead. The black-top of the table at the center of the séance is replaced, invisibly, with a pool of black oil, and very slowly (and creepily…) Misquamacus’s head rises from the table (a real head, covered in the oil) to face his supplicants. The demon sort of “shapes” himself out of the table, and it isn’t an effect that I've seen used before in this particular setting. But there’s still more. One whole ward of the San Francisco hospital is transformed into an Arctic wasteland, covered in ice and snow. And then there’s the incredible moment when the computer manitou -- battling Misquamacus -- explodes and Dr. Hughes suddenly explodes with it on screen. He just goes up in flames. Even the birthing scene is a great gross out moment. Misquamacus casts of Karen like an old sweater and splatters onto the hospital floor before slithering away, off-screen. In my review of The Manitou in Horror Films of the 1970s, I termed Girdler’s last effort a “fun house of film gimmicks,” and today that description seems appropriate. It looks to me like the filmmaker and his team had a ball thinking of the wackiest, most unconventional ways to attack the horror sequences. Not all the effects work, but the creativity is admirable. I haven’t read the novel by Graham Masterson upon which the film was based, but I must presume that it made sense, and connected its narrative together well. The same cannot be said of the cinematic version. For example: why was Karen picked as the “mother” for this resurrection? Why do some Manitou oppose Misquamacus, while other support his cause? More importantly, what is his cause, really? If he is powerful enough to summon Satan as a minion, he must be fearsome and strong, and yet he is undone by…the power of love? The sad thing is that with The Manitou proving such a hit, Girdler had momentum in his career too. I would have loved to see what the filmmaker did with that that currency, and I wonders still, sometimes, of the strange destinations he had planned for future audiences. It's been over 30 years since I read the novel, but my memory of it was that the book was pretty close to the film, with the exception of the ending. There were also more details about Misquamacus and manitous that helped hold the internal logic of the story together (just barely). It was a pretty crazy book to begin with, and the wild visuals of the film kinda pushed that craziness even further to the point of silliness at times. Still, I loved the book and the movie for their sheer audacity. I also liked Tony Curtis very much in the role. A non-traditional casting choice that paid off in this case. At the end of the day, I may not know why I love this film, but I do. It does have a real off kilter appeal. Agree with you on the various set pieces. The black tar manitou is really well done, as is the rebirth. And that climax? So insane as to be near brilliant. The frozen hospital floor was quite memorable as well. Not everyone will like it, but I do.